Wanting to stand out from the flux of much more prominent high school reunion films and yet never quite managing to collect the courage to do so, The D Train has some interesting twists but it doesn’t add up to much which makes it a fairly forgettable ride. Jack Black is Dan, the self-imposed chairman of his high school’s reunion committee who isn’t very popular amongst his peers – they go off to a bar without him, moments after saying they were just going home for the night – and leads a quiet and content life at home with his family, including his wife played by Kathryn Hahn, and at work with a rubbish internet connection. One night, when Dan comes across a TV advert featuring the most popular guy in his year, Oliver Lawless (James Marsden), he heads out to LA on a faux business trip – reluctantly accompanied by his unassuming technophobic boss (Jeffrey Tambor) – to convince Lawless to attend the reunion, which in turn would lead to everyone else being interested in coming. That’s where things take something of a turn – we won’t give things away here, but an incident happens that Dan immediately regrets and, as a result, decides that inviting Lawless is a big mistake – unfortunately, that comes just as Lawless does indeed RSVP and wins the affections of everyone around him, much to the ever-growing discomfort of Dan. Said incident clouds over the film’s second half, which gives the film a bit more of an edge that most bromance films would even dare to tread upon – however, that’s really the only thing that makes it more interesting to watch than anything else. Despite good turns by the cast, in particular Black who tackles his juiciest role since Bernie, the script by first-time directors Andrew Mogul and Jarrad Paul flip-flops constantly between tones – it’s a raunchy comedy at one point when Lawless is graphically describing three-ways with Dan’s dorky 14-year-old son, but a business drama the next with a sub-plot involving a white lie made to Tambor that slowly grows out of control – and never finds its footing. What should be dramatic revelations are softened by an execution that lacks strength which is substituted with restraint and an odd sensation of safety, an odd choice considering the boundary-pushing twist that occurs mid-way through. Mogul and Paul also don’t manage to succeed with making it a character study, as the majority of them are neither interesting nor easy to root for at multiple points. Lawless, who should be the larger-than-life breakout character, is instead a rather bland amalgamation of traits we’ve seen before in faded star archetypes; and Dan, in his increasingly insecure obsession with the man he set out to win over, becomes a monstrous and unlikable nuisance of a control freak, which is only barely resolved by the film’s close. The film’s title takes itself from a list of nicknames Dan wants to associate himself with, but none of them are more accurate than the one we’re thinking of in our own heads. The whole thing is just a bit forgettable, so much so that we had to shorten our review length in order to actually talk about it, because there really isn’t that much we can say about it or even remember. It’s not without some qualities – like we said, there are good turns by its cast, and it handles the whole “business trip” comedy scenario FAR better than Unfinished Business, but that’s not really saying a lot – but The D Train is one that you won’t be kicking yourself for missing. 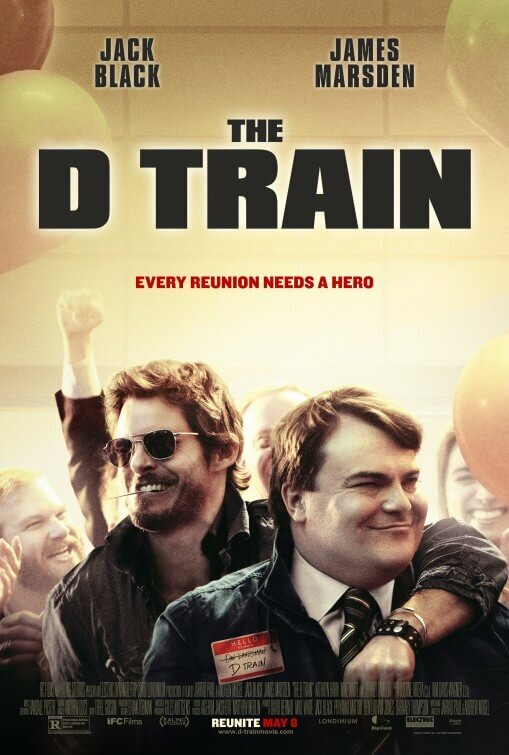 Despite some decent turns by its cast, particularly leading man Jack Black, The D Train is overall a forgettable film that is plagued by an uneven script and direction, and questionable character motivations.